Hi everyone, I’m really happy to announce that a brand new anthology of contemporary Irish poetry has been published today (St Patrick’s Day) in Paris and I am also delighted to say that I have five poems included in the collection alongside a number of exciting and interesting new voices coming out of Ireland in the these early years of the 21st Century. The official launch of the anthology will be take place in Skerries, Ireland on the 23rd May during the Donkey Shots, Skerries First International Avant Garde Poetry Festival (Donkey Shots pronounced Don Quichote) – and all are welcome to come along. 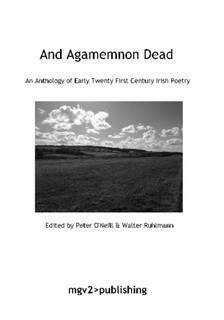 And Agamemnon Dead is a really beautiful collective body of work so please share with as many friends as you can, and if you know any writers who would be willing to review it please pass it on.